Here is the full transcript of Congress vice president and Lok Sabha poll campaign chief Rahul Gandhi’s first formal TV interview with Times Now Editor-In-Chief Arnab Goswami. Arnab: Rahul, Thank you very much. It’s great to have you on Frankly Speaking show today. It's been 10 years as an MP for you, you fought your first election in 2004 and this is your first TV interview. Rahul: It's not my first interview, but it’s my first formal interview of this type. Arnab: Why has it taken so long? Rahul: I have done a little media interaction, prior to this. I have done press conferences and spoken to the media. But mainly bulk of my focus has been on internal party work and that’s where I have been concentrating, that is where most of my energy was going. Arnab: Or is that you have been reluctant to communicate more on one to one basis? Rahul: Not at all, I have had many many press conferences that you have seen. I don't have that issue. Rahul: I like difficult to tough issues, I like dealing with them. Arnab: Now that this is your first detailed and long interview in 10 years, we have a lot of ground to cover. I have one request to you right at the start of the interview, let’s be as specific as possible on the subjects we deal with today. Do I have your Agreement on that? Rahul: Yes, we will be specific but if I would like to sort of explain things in a broader fashion, I think that will okay with you. Arnab: If I want to draw you back into specifics? Arnab: Rahul Gandhi the first point is this; you have just avoided this whole question about whether you are open to PM's post. It seems to me Rahul that you are avoiding a difficult contest. Rahul: See, if you look at the speech I gave at AICC a few days back. The issue is basically how the Prime Minister in this country is chosen. The way the Prime Minister is chosen in this country is through the MPs. Our system chooses MPs and MPs elect Prime Minister. I said pretty clearly in my speech in AICC, that if the Congress party so chooses and Congress party wants me to do anything for them, I am happy to do that. It’s respect for the process. In fact announcing your PM prior to an election, announcing your PM without asking the members of Parliament, is not actually written in the constitution. Arnab: You did that in 2009? Arnab: Of course you did? Rahul: What we did in 2009 was that we had an incumbent Prime Minister. Prime Minister won the election, he then went to Parliament. The members of Parliament decided that, that Prime Minister will continue, and there was actually a process where he was asked. Arnab: But you named your Prime Ministerial candidate? Rahul: We had an incumbent Prime Minister and there was no question of our changing him. Arnab: See Rahul we can go up and down on this question. The fact of the matter is this, who else will they choose, and who else will Congress MPs choose if not Rahul Gandhi? Rahul: That is up to them right, but what one has to do and this is central to what I keep saying is that democracy is about respect of processes. Democracy is about non-arbitrary decisions. Democracy is about spreading decisions; it is not about destroying processes. There is a process in the constitution and that process says, and it is clearly written in the constitution, and it says members of parliament are to be elected by the population and members of parliament are to elect the Prime Minister. All I am doing is respecting that process. Arnab: Are you avoiding a direct face-off with Narendra Modi? 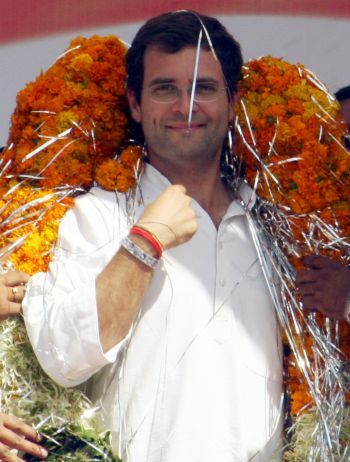 Is there a fear of loss Rahul because this election is not looking good for the Congress party from overall estimates? And the growing belief is that if Rahul Gandhi has not picked up the challenge officially that means that there is a fear of loss, he is avoiding a direct one on one battle with Narendra Modi, you must answer that? Rahul: To understand that question you have to understand a little bit about who Rahul Gandhi is and what Rahul Gandhi's circumstances have been and if you delve into that you will get an answer to the question of what Rahul Gandhi is scared off and what he is not scared off. The real question is what I am doing sitting here, you are a journalist, when you were small you must have said to yourself I want to do something, you decided to become a journalist at some point, why did you do that? Arnab: Because I like and enjoy being a journalist, it is a professional challenge for me. My question is you avoiding a direct face-off with Mr. Narendra Modi? Rahul: I am going to answer the question but I just want to ask you, when you were young and thought of being a journalist what drove you? Arnab: Once I decided to become a journalist, I can't be half a journalist. Once you have decided to get into politics and you are leading your party effectively, you can't be leading your party by half, so I’ll throw the question, with respect, back to you, Narendra Modi is challenging you on a daily basis? Rahul: You are not answering my question, but I will answer the question and that will give you some insight into how Rahul Gandhi thinks. For that I will have to expand a little bit about my growing up, how I grew up and the circumstances in which I grew up. What I saw when I was a child ,was my father, who was a pilot, and because of circumstances was thrown into the political system and all I saw when was small after my grandmother died was my father in constant-constant combat with the system in India and then I saw him die actually. In my life I have seen my grandmother die, I have seen my father die, I have seen my grandmother go to jail and I have actually been through a tremendous amount of pain as a child when these things happen to you, what I had to scared off I lost, there is absolutely nothing I am scared off. I have an aim, I have a clear aim in my mind and the aim is that I do not like what I see in Indian politics, it is something that is inside my heart. It is like in our mythology when they talk about Arjun, he only sees one thing, he does not see anything else, you asked me about Mr. Modi you ask me about anything and the thing that I see is that the system in this country needs to change, I don’t see anything else and I am blind to everything else. ARNAB: Can I draw you back to my question. I will go into those areas and I respect what you are telling me about your personal journey, It’s not Rahul, as if I lack empathy for what you are saying, in fact I am pretty sure many people do but my question to you is Narendra Modi calls you a Shehzada, now let's be very specific Rahul. Narendra Modi calls you a Shehzada, a) what is your view of Narendra Modi b) are you afraid of losing to Narendra Modi, Rahul please answer my question as specifically as you can? ARNAB: And what is your view of BJP’s prime ministerial candidate? ARNAB: What is your view, would like to expound your views, your PM accuses Narendra Modi in his press conference of presiding over "the mass massacre of innocent citizens on the streets of Ahmedabad." Mr. Rahul Gandhi my question to you is this, do you agree with your PM when he says that? ARNAB: How do you accuse Mr. Narendra Modi of it? ARNAB: How is Mr. Modi responsible? ARNAB : How is Narendra Modi responsible for the riots when the courts have given him a clean chit, politically your party's tact to criticise Narendra Modi and draw him into the Gujarat riots? RAHUL: Our political party is fighting an ideological battle Against the BJP and let me draw out the two pillars- our party believes that women should be empowered, democracy should go to every house, that RTI, and the MNREGA paradigm should be further expanded. The BJP believes power should be extremely concentrated in this country, few people should run this country and the large mass of this country should have no voice. ARNAB: Specifically speaking how is Narendra Modi, your party criticised him for the 2002 Gujarat riots, and how can you do that when he has been given a clean chit in the Gulbarg massacre by the SIT of the court. It was challenged in the court, the court upheld the SIT finding and therefore legally speaking Mr. Gandhi you cannot draw Narendra Modi into the Gujarat riots, implicate him personally. Do you believe that strategy of your party is fundamentally wrong? RAHUL: The PM has stated his position on the Gujarat riots. The Gujarat riots took place, people died, Mr. Narendra Modi was in charge of Gujarat at that point. I am bringing you to a real ideological battle that is taking place here. The real ideological battle that is taking place here and the one we are going to win and that has always been one in this country is the battle of empowering people in this country. Of course there is your point of the Gujarat riots and it is very important that people who have taken part in this kind of thing are brought to book. But the real issue at hand here is empowering the women of this country, giving them true power. We talk about India being a superpower we can only be half a superpower if our women are not empowered. What I want to do is going forward is basically focus on three things. Focus on empowering our people, truly empowering our people, giving them democratic rights within the political party. I want youngsters who come in and really, really push democracy in the party. I want to empower them and I want to make India, together with everybody, taking everybody together I want to put India on the manufacturing map, I want to make this the centre of manufacturing in the world. I want to make this place at least as much as a manufacturing power as China. ARNAB: You say that Narendra Modi was CM during the Gujarat riots and the BJP was in power. The BJP was as much in power in Gujarat during the riots as much as Akhilesh is in power in UP or for that matter the Congress party was in power when the 1984 Anti Sikh riots happened, now let me quote, you spoke in one of your speeches of the anger of your Grandmothers death, I think it was campaign trail in Rajasthan. You spoke about knowing the people who killed her and you spoke about anger and managing your own anger and quelling your own anger and drawing it into strength elsewhere. Now that speech of yours became a subject of controversy with Narendra Modi posing a series a questions to you on 1984 and he said the following and I want to quote him and your categorical and specific response "he's crying for the assassination of his Grandmother but has he shed tears of those killed in the 1984 riots, I want to ask the Shehzada and you remember Mr. Gandhi he's constantly deriding you by calling you a Shehzada, whether your party kills Sikhs in anger when your Grandmother died, so following from this I have 2 questions, my first question; do you acknowledge the role of congressmen in the 1984 riots, B) will you apologise for the riots as your party demands an apology from Modi for the Gujarat riots? RAHUL: Two things, in 1977 when my Grandmother lost the election we went and lived ....and the people who came with my Grandmother, those people who stood by my Grandmother were Sikhs. Pretty much everyone had deserted my Grandmother but the Sikhs were standing with my Grandmother. I think the Sikhs are probably one of the industrious people in this country. I admire them; we have a PM who is a Sikh. I don't have the same world view as my opposition. What those two people did to my Grandmother, was two individuals, I don't turn around and take my anger which existed then, frankly, it doesn't exist now and brush it onto an entire community, that's just not me. ARNAB: I am sure you don't, my question is do you acknowledge the role of Congress men in the 1984 riots because there must be justice. Mr. Gandhi there has to be finality, the Gujarat riot cases have moved forward and many people have got justice, if I just compare that to the 1984 riots, you can look at the status and case history of what happened to Mr. Sajjan Kumar, Jagdish Tytler, HKL Bhagat, Dharam Das Shastri and the one story that you hear there is these cases are endless, they go on for the longest period of time. I am asking you again, Mr. Gandhi before you seek an apology from Modi would you apologise for the 1984 riots, would that be something that you consider? RAHUL: I do not take my anger which existed on 2 individuals who did something evil and wrong and overlay it on millions of people. I think that's criminal. Did the Sikh riots take place in Delhi? Absolutely. Were they completely wrong? Absolutely. ARNAB : Were Congressmen involved? ARNAB : Has justice been delivered to them? ARNAB : Explain that. Government of Gujarat was aiding and abetting the riots is what you just said, explain that? RAHUL : I mean it’s not me...it’s the large number of people who were there, large number of people who saw actively the Government of Gujarat being involved in the riots. ARNAB : You will keep that line despite the CM getting a clean chit form the courts? ARNAB : They saw the riots? ARNAB: What are you saying? Can you explain? RAHUL : I am saying that there was difference between the 1984 riots and the riots in Gujarat. The difference was that the Government in 1984 was trying to stop the riots, trying to stop the killing whereas the Government in Gujarat was allowing the riots to happen. Arnab: If the government in Delhi and in the center was trying to stop the riots in 1984, then tell me, how is it possible that Sajjan Kumar was named in Fir’s on the grounds of inciting violence in outer Delhi leading to the murder of Sikhs. The status of the case is known. How is Jagdish Tytler, accused of inciting the mob in Pulbangash leading to murder and rioting in the area. How is the late HKL Bhagat accused of inciting violence. And you know that a plea in the Delhi Court was closed after his death. How did these Congress leaders do what they did allegedly, if the government was so strongly and proactively acting against the riots? Rahul: There is a process. See there is a legal process. And that process is on. Okay. Arnab: There was an SIT finding. It was challenged by Zakia Jafri. It went up there and the courts upheld what the SIT found. Are you questioning the wisdom of the courts Mr. Gandhi? Rahul: Look. All I'm saying, all I'm saying is that there is a difference between the 1984 riots and the Gujarat riots. The simple difference is that in 1984 the government was not involved in the massacre of people. In Gujarat it was. The question is why do these kind of things take place. Why is it that the Gujarat riots took place? The Gujarat riots took place frankly because of the way our system is structured, because of the fact that people do not have a voice in the system. And what I want to do. And I have said it and I will say it again. What I want to do is question the fundamentals over here. What I want to do is ask a couple of questions. I want to ask why candidates that are chosen in every single party are chosen by a tiny number of people. I want to ask why women have to be scared to go out on the street. I want to ask these questions. These are fundamental questions. Arnab: I appreciate that you believe in transparency. I'll move away from Gujarat but I must say that I have not found this comparison between 1984 riots and 2002 riots that they are two different cases. I can't take this at face value Mr. Gandhi. The reason for this is because in both cases the government, the accusation is that the government could have done a little bit more. But at the same time I want you to, once more if you can substantiate. You stand by what you said, that the Chief Minister and the government of Gujarat played a role in abetting the riots? You stand by what you said? Rahul: All I'm saying is there is a difference between the 1984 riots and the Gujarat riots. The difference is that the government of the day in 1984 was not aiding and abetting the riots. That is all I'm saying. Arnab: So you don't need to apologise for the '84 riots. If someone seeks an apology from you, will you give it? Your Prime Minister has apologised for the riots. Expressed deep regret. Will you do the same? Rahul: First of all I wasn't involved in the riots at all. It wasn't that I was part of it. Arnab: On behalf of you party. Rahul: I think that riots, as all riots, were a horrible event. Frankly I was not in operation in the Congress party. Arnab: Mr. Gandhi let's move on to the RTI. Which is the single biggest legislation to combat corruption. Which you said in your speech at the AICC that was something that you were speaking about. Now, I find it ironical that a party which has 90.38% of its funds from cash between 2008 and 2012. 89.11% of its money comes from unaccounted sources, unnamed sourced. Why would you not say charity begins at home? And let us put the Congress party and its funds under the scanner of the RTI. Why would you not bring the same freshness of perspective in this case as you did when you dealt with the issue of the ordinance. Rahul: I think that political parties should be under RTI if political parties feel, and it’s a law that has to be passed in parliament. If political parties unanimously feel that that should be the case then it should be the case. Arnab: What was your view? What will be your view on it? Rahul: My position is that the more openness the better. Arnab: So your own personal view is that your political parties should be under RTI? Rahul: See the issue is this. Laws in this country are passed by parliament. What one needs to do is pass a law in parliament that brings RTI in the political party. I have a personal view on it but you have to take that view through parliament. I have a view also for example on the six bills that are sitting in parliament. Arnab: I'll come to that. But my question is on the RTI. I want your view on it. You are a very influential politician. You have demonstrated some of your actions in the past that what you say and do can influence the decisions in government and in parliament. So my question to you is very significant. You said, in the AICC you said we enacted this revolutionary law to hand you power knowing fully well that it would place our own government under severe scrutiny. I agree with you. What about placing your own party under scrutiny? Are you open to that? Rahul: I am the first person who has been saying over the last five years, talking about transparency in the party. I have made the Youth Congress and the NSUI fully elected bodies. I have spoken about the six bills in parliament. I have spoken about the Lokpal Bill and I have pushed the Lokpal Bill. I was involved in the RTI. We worked together to bring the RTI. So as far as transparency in the political party is concerned I am absolutely for transparency. There are questions about the RTI that need to be discussed and thought through. The real question is that our system is based on different pillars. And the question is which ones of these pillars should have RTI. Because, if you only put RTI into one pillar and you don't have RTI in for example the judiciary and the press and in other areas then you might create an imbalance. Am I for opening up? Am I for bringing RTI into as many places possible? Absolutely. Am I for creating an imbalance and weakening the legislative structures of this country. No I am not. Arnab: How does putting political parties under the purview of the Right to Information Act, how does that actually weaken the legislative process? It brings in transparency. Rahul: It brings in transparency but it changes the balance of power. have RTI. Other components of the system do not have RTI. Arnab: The press does not rule the country. Rahul: No it doesn't. Okay. The Judiciary does not have RTI. So you have to have a complete thinking. So if you want to bring RTI. If you want to deepen RTI, you have to think about it in a composite manner. You cannot just say, 'Okay let’s put RTI here, put RTI here'. You have to have a strategy to put RTI and open the system together. And as far as opening the system is concerned. Arnab: But you are willing to let a discussion happen on brining political parties under RTI? Rahul: Of course I am. Arnab: You're not opposed to that. Rahul: No I am not opposed to any discussion, ever. Arnab: On this specific subject. Rahul: On all subjects. One has to take care that one is not creating imbalances in the system. And that's something that one has to discuss. Arnab: Mr. Gandhi do I sense that you are almost committing yourself and then pulled back. Rahul: No, no, no. I have said that I am happy to have a discussion. Arnab: You're happy to have a discussion? Arnab: On bringing political parties under RTI? Rahul: But let me just go back and let me give you... Let me go further than that. The central question in all this is who chooses political candidates and how? The central issue in all this is what is the power of the Member of Parliament, the power of the MLA and the power of the Pradhan in political system? If you look at the legislative power of a Member of Parliament, you look at the legislative power of an MLA today and you look at the role he plays in Parliament and the role he plays in the assembly. He doesn't actually make laws. He presses buttons. Go to a state like Uttar Pradesh and you look at actually the law making, the law making done by the MLAs, it’s extremely limited. You can't talk about bringing people into politics. You can't talk about opening up the system until you start to empower these people. Arnab: Was it part of the empowerment of people that Ashok Chavan was protected in the Adarsh Scam despite the fact that the judicial commission actually said that he was involved in a quid pro quo? A Chief Minister, an ex Chief Minister forced to go because of one of the biggest scams. Which was by the way Mr. Rahul Gandhi played out greatly on TIMES NOW. Is he being protected? The CBI is not getting permission to prosecute him. You can say all this Mr. Rahul Gandhi about the legislative framework to fight corruption. But my question to you is more fundamental. You have not shown the political will to use your tremendous influence to ensure that Ashok Chavan faces justice. You said a little bit and you moved back. Why are you still protecting Ashok Chavan. Rahul: I'm sorry the Congress party wherever we have had issues of corruption we have taken action. On every front. We are the ones who brought the RTI which is the single biggest weapon against corruption. And we got it ourselves. We are the ones who delivered RTI to this country. Arnab: Your Maharashtra cabinet rejected the judicial commission report on Adarsh. And after that the governor refused to give prosecution to go against Ashok Chavan. None of this was part of the empowerment of the people. You said you're not for it. After that in some kind of tardy, if I may say so, partial acceptance of the report. The bureaucrats are blamed and each and every politician including Mr. Ashok Chavan gets away. I want to ask you Mr. Rahul Gandhi. You said you will not compromise. You will not make small compromises. How big a compromise was it for you to continue to protect Mr. Ashok Chavan. Why are you protecting Ashok Chavan? Arnab: The Chief Minister did a sort of partial acceptance which basically means bureaucrats are faulted in the report. They are penalised. Indicted politicians get away. Mr. Rahul Gandhi I am asking you this because you've come up on the issue. Do you have the political conviction to push this through. What will you say to the people watching this interview today, who will say, ‘You know what, you said it’ but you're not taking responsibility. The man still gets away scot-free. Why should a bureaucrat be punished and a Congress politician be let off? Rahul: What I will say is that in the Congress party anybody who does any act of corruption will be taken up and punished. Arnab: What about Ashok Chavan? Arnab: But he has got away. there bring them in. Pass them. Arnab: But your words are not matching your actions Mr. Rahul Gandhi. You're saying it but all the politicians they got away scot-free, including not just Ashok Chavan. There are several NCP ministers. All of whom tried to interfere and meddle in the process. They used the name of Kargil Mr. Rahul Gandhi to give themselves private profit. If you say this and you have the conviction why are you not following it through? Rahul: I have made it absolutely crystal clear right in front of the press what I think about this issue. Rahul: What do you mean nothing happened? Arnab: Ashok Chavan faces no action. Rahul: Absolutely not. What all I'm saying is that anybody, regardless of who he is, if there is any corruption by any Congress person we will take action. Arnab: Would you like to see Ashok Chavan facing action? Rahul: We have punished our own minister. We have put the most powerful bills in the Parliament house. Please get those bills passed. That's what I tell the opposition in this country. Arnab: I am giving you two examples. One ex Chief Minister and one a current Chief Minister. Virbhadra Singh. My question to you is we have papers which have shown that the Chief Minister takes money from a company which his government does business with. And he takes money. Large amounts of money are put in. And then he says I just took the money as a personal loan because I wanted to do renovations in my Palace. My question is Mr. Rahul Gandhi. And this is really fundamental because you have taken a position on corruption of late. Do you think it appropriate of another Chief Minister of a state to be deciding on the fate of a company, that he is revealed to have close links with? And by not speaking on it, because you've not spoken on it, aren't you missing on yet another opportunity to address the issue of corruption with Virbhadra Singh? Rahul: As far as any corruption done, there is a legal process. And that legal process should be followed and concluded. As far as my personal view is concerned, anybody who is corrupt should be brought to book. Arnab: Was the legal process completed when A Raja was asked to leave the cabinet? Rahul: We took action against the DMK ministers. Arnab: Was the legal process completed when Mr. Kalmadi was asked to leave as Secretary of the Congress Parliamentary Committee? Rahul: We took action on the corrupt ministers. We have passed a bill in parliament. The Lokpal Bill. The most powerful thing. We got you RTI and we got six bills sitting in Parliament house. We have to change the way the system works. We are always talking about peripheral things. We are never talking about the core reason this system is corrupt. The core reason the season is corrupt is that there is too much concentration of power in the system and people on the peripheries do not have power. The people on the streets do not have power. And that the reason that happens is that our political system, political parties are shut. We need to open the door of the political parties. We need to move, carry out more legislation like RTI and we need to change the system. Arnab: Are you open to taking action on Ashok Chavan and Virbhadra Singh? Have you seen the papers yourself? Will you examine them Mr. Gandhi? Will you examine it? Rahul: Anybody who is corrupt should be punished. I am not a judge. So if there is a legal process and there is a result of the legal process, absolutely they should be punished. Arnab: There is no case being followed against Mr. Virbhadra Singh. Rahul: Yes I know that but I am saying that it is not my job. My job is when I see issues of corruption, take action on it. That's what I do. Arnab: Well Mr. Gandhi now you see. The other question is, should you have spoken up much much earlier? You know you didn't. Everyone wants to know today why you didn't speak up during 2G. Why didn't you speak up during Coalgate? Why didn't you speak up? I think it was June 2010 that TIMES NOW broke the CWG scam and railgate. You could have spoken up. And you can't take the defence that you were not very actively there. You have for some time been effectively in-charge of the 2014 re-election campaign. Rahul: My position was that I report to the Prime Minister. Whatever I felt I had conversations with the Prime Minister. Whatever I felt about the issues I made it abundantly clear to the Prime Minister. I was involved in the legislation, RTI legislation. And now I have helped pass the Lokpal Bill. I bring you back. The real issue here is participation of people in politics. It is bringing youngsters into the political system, it’s opening out the political system. That's where nobody wants to talk. Everybody is perfectly happy with 500 people running the entire system in India. Nobody, none of you want to raise that issue. The fundamental issue. How do we chose candidates? Arnab: Do you feel that you have undermined by remaining silent? I want to ask you this when the Pawan Bansal and Ashwini Kumar episode happened for six days the Govt batted back, everyone said this is unacceptable. Six days the Parliament was washed out, do you feel in retrospect that you could have spoke out earlier, Mr. Gandhi please be frank with me on this. Rahul: What I feel is that this country needs to look at the fundamental issues at hand, the fundamental political issue at hand is that our Political system is controlled by too few people and we absolutely have to change the way our political system is structured, we have to change our Political parties, we have to make them more transparent, we have to change the processes that we use to elect candidates, we have to empower women in the political parties, that is where the meat of the issue but I don't hear that discussion, I don’t hear the discussion about how are we actually choosing that candidate, that is never the discussion. Arnab: So I am asking you how are you choosing Ashok Chavan? That is a discussion I am willing to have, how are you choosing Virbhadra Singh , they are elected representatives they hold clout, does their clout make them oblivious to public accountability and scrutiny? bring youngsters into that and that no-one is discussing. Arnab: Mr. Gandhi a lot of people felt when you said that I will not make compromises, you have got a round of applause when you spoke up on the ordinance. There are many people have faulted you for your technique, they say you could have chosen a more discreet way. My question is will you make compromises, are you willing to make compromises for political purposes, alliances or convenience? Rahul: My long term view is that we need to take the Indian political system to a different place. We need to bring in youngsters and we need to move away from this concentration of power. Unfortunately the political system today is at a particular place and I can’t simply ignore the fact that the political system is at that place, so certainly there are points at which you might have to take a decision that you are not a 100% happy with but the long term idea for me is to transform the system, to bring in youngsters and make sure they are empowered. Arnab: Lalu Prasad has been convicted on the 30th of September 2013 for the alleged fraudulent withdrawal of crores of rupees from the Chaibasa treasury in the 90s, the case you are completely aware of. My question is will you make that compromise despite that case to enter into a political arrangement, because when you spoke on the ordinance there was also the backdrop of that case coming up, will you make that compromise? Rahul: These decisions of the Congress party are made by senior leaders. Arnab: You are the boss. Arnab: If I were to take that further and challenge you that there is talk of a possible alliance with the DMK and Lalu Prasad, and if you are accused by your political opponents that he talks about not making compromises but he agrees to enter into convenient alliances with parties for short term gains, how will you justify yourself? Rahul: We are fighting an election, we are going to win that election, there are our alliance partners, there is our alliance partner in Maharashtra, and there is our alliance partner in Bihar and Jharkhand. We are making an alliance with their view not with an individual. Rahul: No, we are making an alliance with a political party. Arnab: But these are not settled alliances yet but you are open to them? Arnab: Mr. Gandhi the other question is about price rise and you got a round of applause when you spoke about the LPG cylinders, you told the Prime Minister quite charmingly - that Mr. PM please make things less difficult for households. But I am questioning your silence all these years, because in this period from 2004-2013 the wholesale price index of food goes up by 157%, vegetables by 350% and Onions by 521%, you don't speak on that. When Raj Babbar says you can get food at 12 rupees a meal, you don't speak then , when Rashid Masood says you can get food at 5 rupees a meal you don't speak then, the accusation there is and the general feeling Mr. Rahul Gandhi is that you have really woken up to the issue after the 4-0 drubbing in the last state election, do you concede that? Rahul: No, I think women are the backbone of this country and women need to be empowered and I felt that price rise is an issue cylinders were a big issue, I went to Kerala and I go a sense that women were concerned about that and I made that view clear to everybody in the AICC session. Arnab: But you didn’t intervene earlier? Rahul: I have been working with the PM on the Price rise issue, I have been in discussions with him and we have taken steps in our states, where we have called the Chief Ministers and we have taken steps where we have actually reduced the prices of vegetables in our states, so it is not that I just woke up, it is that I have been working on it systematically. But what I really feel that we need to start looking at empowering women, bringing them in and listening to them. Arnab: Does the Govt's track record on prices not make your faith in the PM shake a little? Rahul: We are working on prices, as I said we have spoken to our Chief Ministers and we have reduced prices in states where we are in power. Arnab: So you have not woken up to it only because of political purposes? Arnab: Mr. Gandhi what do you think of the Aam Admi Party and why are your views constantly shifting on the AAP, on the 8th of December after the loss you quite candidly spoke about traditional and non-traditional parties – non-traditional parties being those who have involved a lot of people. Suddenly I find that now seem to be over critical of the AAP, I presume you were talking of them when you said that there are people who can give haircuts to the Bald, were you referring to them when you said parties who over market themselves, which parties were you talking about? Rahul: The work that I have done in the Congress party, the work that I have done in the youth Congress and the work that I am going to do in the future is about bringing in youngsters into the party, strengthening processes, strengthening candidate selection process and strengthening policy processes. I made a comment about the AAP where I said that there is something that we can learn from them and what I felt that we could learn from them is that they reached out to people in a particular way that was good, there are things that I don’t think we should take away from them. I think we have fundamental strengths in the Congress party and it is something that we have been working on for 3-4 years now and the real power of the Congress party is the depth of the organization and you can't makes changes by destroying things. Arnab: But in a recent interview Mr. Chidambaram said he felt the decision to give support to the AAP was unnecessary and that the opinion was divided on this within the Congress. Having seen what you have seen in recent days and the chaos that followed in Delhi, do you agree with that view? Do you feel in retrospect that support to the AAP is something you shouldn't have done? Please be candid and frank with me on this. Rahul: We thought we would assist them, because our party felt we should give them a chance to prove themselves and one can see what they are doing and one can see exactly how much they have proved themselves. Rahul: He is a leader of an opposition party like many others, what we have to do as the Congress party and again in front of us is an election, what we have to do is 3 things. One is we have to transform ourselves, we have bring in youngsters, we have to give them space. Two is we have to look at manufacturing, we have already set up the corridors North, South, East and West, how we can take the energy of the Indian people and build a manufacturing superhouse... That is what I think the real issues are. Arnab: I am not implying, there is a theory that the Congress is propping up the AAP and keeping them on an extended leash so that they somehow divide anti-Congress vote bank. Had the AAP not been there the BJP would have done better and that experiment could be extended? Rahul: I think you underestimate the power of the Congress party, I don’t think the Congress party could even do that if they wanted to. The Congress party is an extremely powerful system and all the Congress party needs to do is bring in younger fresher faces in the election which is what we are going to do and we are going to win the election. Arnab: You are confident about that? Arnab: And if you don't win do you take full responsibility for it ? Rahul: If we don't win, I am the VP of the party of course I will take responsibility for it..
Rahul: I have already said that regardless of who the person is, if there is an issue of corruption the law should take its own course, that’s my position. Arnab: Mr. Gandhi I now want to understand a little bit on your personal side, my first question is that you have faced a lot of criticism, how do you handle criticism? People say he has his heart in the right place but is he a vote catcher, they pull out all the recent state elections UP, Delhi, MP, Rajasthan and Chhattisgarh, they say he has not despite playing an active role achieved considerable electoral success. They are questioning your vote winning ability, what would you say to them Mr. Gandhi? Rahul: That ascribes huge power to the Congress party, I think the Congress party’s strength comes when we open up when we bring in new people, that is historically been the case and that is what I want to do. Arnab: Mr. Gandhi why do you keep invoking your family name. I have seen you refer, with respect, to your father and your grandmother repeatedly. Now Mr. Gandhi some would say you should be careful of doing that because when you invoke your family and its achievement from the Congress, you can be accused of touting your family background for your own political career and the second is you would be re-entrenching yourself in the role of being a dynast at a time when being a dynast is not seen to be a good thing? Do you agree? Rahul: I don't actually keep invoking my family name, I have mentioned my family name once or twice and then people report that. The real issue is that I didn't choose to be born in this family, I didn't sign up and say that I like to be born in this family it happened, so the choice in front of me is pretty simple I can either turn around and say okay I will just walk away from this thing and leave it alone or I can say I can try and improve something. Pretty much every single thing I have done in my political career has been to bring in youngsters , has been to open up, has been to democratise. I am absolutely against the concept of dynasty, anybody who knows me knows that and understands that. But you are not going to wish away dynasty in a closed system, you have to open the system. Dynasty or children of politicians becoming powerful happens in the BJP, it happens in the DMK, it happens in the SP, it happens in the Congress party, it happens everywhere. Arnab: Then how are you different? Rahul: You have to go into why it is happening. Arnab: It is happening because dynasties are allowed to proliferate, it is because a Scindia's son is a minister a Deora’s son is a minister a Pilot's son is a minister. A PM's son is the Congress VP that is dynasty. Change is not happening at the top, you want change at the bottom. There are people out there who are saying that we want change at the top. Rahul: The reason children of politicians keep getting repositioned is because the system is closed. You are not going to change that without opening the system, you are not going to open the system without having processes, the system is not going to open by waving a wand and saying Abracadabra let us open the system. It is going to take time, it is going to take effort and it is going to take structure. That is the work that I do. That is the work I spent a whole bunch of my time doing that is the revolutionary work I have done in the IYC and the NSUI that is the work we are doing when we talk of an open manifesto. That is the work we are doing when we talk of 15 parliamentary seats being chosen. Rahul: Absolutely, because one needs to set up the systems, if I was to suddenly launch into 543 seats directly elected by our people the system would explode. What I need to do is I need to set up an idea, test the idea, run the idea, if it makes sense, if it works then move it to the rest of the party. The step we have taken with those 15 primaries, we get that much of a little piece in the newspaper, but that is probably the biggest political step taken in this country. It is a huge-huge step and I think those are the types of questions one needs to ask, one doesn’t ask them, one asks questions that don't actually reach to the heart of the issue. You are talking about India, we have had a 1 hour conversation here, you haven’t asked me 1 question about how we are going to build this country, how we are going to take this country forward, you haven’t asked me one question on how we are going to empower our people, you haven’t asked me one question on what we are going to do for youngsters, you are not interested in that. Rahul: But you spent some time at Cambridge? Arnab: I was a visiting fellow at Cambridge for a while. Rahul: So where were you at Cambridge? Rahul: So I was at Trinity in Cambridge, I spent a year there, I did my M.Phil there. Arnab: I want your response to Subramanian Swamy, how do you deal with this? Arnab: Would you like to show him your degree? Rahul: He has probably seen my degree, I have given a sworn affidavit saying I that I have got these degrees, If I am lying on these affidavits let him take the legal process and solve it , what more do you want me to do. RAHUL: Why should I challenge him? RAHUL: He's been attacking my family for 40 years. Why should I challenge him? RAHUL: I respond by understanding why I'm being attacked. I'm being attacked because I'm doing things that are dangerous to the system. I'm being attacked because I'm asking questions that are dangerous to the system. And I'm not asking superficial questions. I'm not asking questions over here (pointing at the ceiling). I'm asking questions over there (pointing to the ground). And everybody understands that this fellow here is not just a superficial chap who talks. This fellow over here is thinking deeply and is thinking long term. That's why I'm attacked. I understand that. And frankly, attack me all you want. Beat me to death. It's not going to stop me. I'm going to keep doing it. And I'm going to ask the questions that are relevant. And you know what, I have thousand people in the Congress party, two thousand people in the party who are working on this stuff. They're not letting go. And I'm proud of them, they're not letting go. It doesn't matter. Keep throwing stones at us. That's the point. The point is, people who are attacked in this system, the people who are actually attacked, are the ones fighting the system. You understand that? They're not the people who sit and ask, the superficial questions. They're the ones who're actually saying, let's do something about this system. They're the ones who are going deep into the system and understanding that this is the crux of it. And the crux of it, Arnab I've told you. The crux of it is how we choose candidates. The crux of it is how we make policies. That's the crux of it. The thing is, you don't like discussing it. You like discussing stuff that really, doesn't go to the core and I'm a serious politician. I'm not somebody who's here to get power, or make money or something. I'm somebody who's here, who's seen what the system does to people. I've seen, and I can give you example after example which is on my mind. But I'm not going to fight the superficial battle. I just am not. It's not interesting to me. I'm going to fight a battle. I'm going to fight a deep battle. I'm going to take the youngsters of this country and line them up. And I'm going to then take the system on. Don't forget that. ARNAB: You don't have a thick skin, Mr. Rahul Gandhi. Politicians need to have a thick skin. ARNAB: You say you're a very serious politician. I assure you Mr. Gandhi, I'm a very serious journalist. Therefore when I interview Rahul Gandhi, his first interview in 10 years, it's my responsibility to ask you specific questions. I'm glad you're taking them. My next question to you, and I have only two left. Mr. Gandhi, how much have you been affected by defeats and when we see, for example the visuals of Priyanka holding you after the U.P election loss. That picture, almost in a protective manner that Priyanka is holding you and you are walking away. You tell me what's happening in your mind out there. Do you feel overwhelmed by loss, by defeat, because you've had quite a few off late? How have you dealt with it? RAHUL: It all depends on what you're trying to do. I told you that I'm here because I want to help use the energy of this country. I want to make this country powerful. I want to project the ideas of this country. To do that, I think there are basically 3 things one needs to do. One, is changing the way we do politics here. Getting away from the superficialities, getting away from the small issues and moving deeper into the issues right. Questioning the system, changing the system. Things like RTI, things like Lokpal, things like how we choose our candidates. Things like bringing youngsters into politics. Second is empowering the women of this country. Really bringing them into the system. Really pushing them forward. And third is using the energy of the youth of this country. Bringing in the type of jobs that they need. This stuff is not done in 5 minutes. This stuff is frankly not done in this type of discussions. This stuff is done through concentrated thinking and long term work. It's frankly difficult work, it's painful work. If we're thinking about that and thinking that's what we want to do, defeat just makes you stronger, it makes you want to do more. I don't go into an election thinking, if we lose it's the end of the world. We lose some elections, we win some elections. The real thing is that it's a heart thing. It's a soul thing. Why are you here? I asked you that question, why am I sitting here? I'm sitting here because I feel with all my heart that we need to change the system here and not enough people are actually asking that question. ARNAB: Mr. Gandhi, my last question to you in the course of this interaction is this. Your father was forced into politics by circumstances. In your case as well, when you said power is poison and spoke about how your mother Sonia Gandhi came and she cried. If I put that together with some of what you've said, it might reinforce the image of a reluctant prince. It's not my phrase, I'm sure you've heard this phrase used against you or to describe you a number of times. Therefore Mr. Gandhi, the last question is this. Had you not been a Gandhi, would you have been in politics at all? RAHUL: If you look at my spirit, regardless of what I do, if I'd been born in India, regardless of what I do, I don't like unfairness. It just makes my blood boil. I don't like it. And in whatever I did, if I saw unfairness, I would stand up Against it. That's the heart of my politics. ARNAB: If you were not a Gandhi, would you be in politics? Some say this is a circumstance thrust on you Mr. Gandhi. You've been thrust into this situation. You're trying to justify to yourself that you need to do it. Heart of heart, are you a politician? Had you not been a Gandhi, would you be in politics? RAHUL: You sort of implied that, but maybe I look like an anomaly in the environment that I'm in. Maybe that's what you're saying and frankly in a lot of ways, I am an anomaly in the environment that I'm in. The power is poison remark, and I tell this to my sister, I tell it to my mother and my mother tells it to me. I don't get driven by the desire for power. I'm just not driven by it. For me power is an instrument that can be used for certain things. But for me, it's not interesting to own it, to capture it or to hold it. Maybe its because of my family circumstances and what happened to my family. Power per se, the quest for power, the thirst for power is not there is me. What is there in me, is a desire, a strong desire to reduce the pain that people feel. To reduce the pain that people feel as a result of the system that is predatory. As a result of the system that need not be there. As a result of system that can change if we just start to ask the deeper question. And we stop asking the superficial questions. Again, and maybe the seventh time I want to repeat it to you. What are those deeper questions? The deeper question is, why is power so concentrated in this country? Why is it that the Chief Minister of a state has the access to any decision in the entire state? Why is it that candidates are chosen in closed rooms? Why is it that people do not have access to the candidates' decision? Why is it that our policies are made behind closed doors by 5 or 6 people? Why is it that the perspective of one minister is completely different from the one who is following him? What that's telling me is that we're not exactly taking the voice of the people into policy. We're not actually taking the voice of the people into the political system. You said about the Aam Aadmi Party and you said, 'you criticised them and you praised them'. I liked what I saw as far as the representation, bringing in people, I thought that was an interesting concept. We've done that kind of stuff in the Youth Congress. That was interesting to me. ARNAB: Isn't bringing in people when you disregard the legal process and sit on a protest outside Rail Bhavan and then you also force your decision and your minister is always right. You avoided my question on the Aam Aadmi Party and I'm glad you've come to it. Tell me Mr. Rahul Gandhi, were you angry with Sushil Kumar Shinde giving a face-saver to Arvind Kejriwal? It was reported. I didn't mean to go back to it, you brought it back. The accusation is that you're still doing deals with the Aam Aadmi Party? RAHUL: What I liked about what I saw in the Aam Aadmi Party was people coming into their system. I liked that. But what's different between us and them is that we have structure. We develop processes. That I didn't see much of. ARNAB: Were you upset with Mr. Sushil Kumar Shinde for giving them a way out during the recent Dharna? Do you fell they should've been offered a face-saver? ARNAB: How is it superficial? RAHUL: No it's not. Whether Mr. Shinde should've apologised, whether he should've done this or done that is, it's a fact and it happened. But the real core issues in this election are, 1)Are we going to head towards a democracy, towards deepening our democracy and towards opening up the system or are we going to head towards concentration of power? 2) Are we going to head towards empowerment of women? Are we going to be a half strong nation? Be a half proud nation? Or are we going to actually empower women? Those are the questions. And you know, if you listen to the debate that's going on, about the elections, that's not the debate. There's nothing in the debate about how we're going to move forward on the RTI paradigm. How we're going to move forward on the corruption paradigm. There's nothing in the debate about funding of political parties. There's nothing in the debate about how we're going to choose political candidates. There's nothing in the debate about how policies must be made. These are the fundamental things. These are the things that actually make an impact. RAHUL: I'm debating these issues by building structures in the Congress party that's going to transform it. RAHUL: You're more than welcome. You have to start that debate. As far as I'm concerned, the debate is taking place. RAHUL: You start the debate. But the real issue is doing this stuff. The real issue is doing this stuff in the party machine. The only people who are doing that, is us. And frankly, we can stick for it. We've just said that 15 constituencies in this country in the Congress party are going to be chosen by primaries. No one said a word about it. ARNAB: Of course, it's mentioned everywhere. It hasn't impressed too many people. RAHUL: But the discussion hasn't gone there. So all I'm saying is, as youngsters and as serious politicians, one has to ask the fundamental questions. The fundamental question this election is, are we going to open up the system? Are we going to close the system? What is going to be the role of women going forward? How are we going to get jobs for youngsters in this country? You asked me a whole bunch of questions. You didn't ask me once on how we're going to get jobs for youngsters in this country. You didn't ask me once about what we're going to do for the women for this country. And I'm going to tell you what I think. ARNAB: But Mr. Rahul Gandhi, if I was to do that, I would listen to a Rahul Gandhi speech as I said. This is an interview. I'm getting an opportunity to ask you specific questions. You called my specific questions superficial. I, with respect disagree. I feel my questions are specific and you need to answer the specific questions as specifically as possible. RAHUL: You're more than welcome to ask these questions. But let's also move the debate to a place where we're actually reaching towards fundamentals. What should be the role of women in this country? How can we enhance their role? How do we bring jobs to millions of people. For example, every single person who comes to me from abroad, Japan, France, Germany, America and tell me 'Listen, we need an alternative to Chinese manufacture'. We're very happy with what the Chinese give us, but we need another port. There's global energy saying we want to move manufacturing to India. The Congress party, the UPA Govt have built the corridors, we've built the North-South, East-West corridor. We built 3 times the roads the NDA built. Why are we not having a discussion on those topics? ARNAB: I asked you that question during the course of the interview. Did UPA Govt let you down? Because Mr. Rahul Gandhi, when foreign investors want to invest in India, they want a clean investing environment. They don't want crony capitalism. They do not need scams. They do not need ministers who behave like Govts exist on their rent. They do not need the A Rajas and the Aircel Maxis scams. The climate Mr. Rahul Gandhi has become vitiated with corruption. And therefore, the answer to that is and I really want you to address this. If you had spoken out earlier, and lets bring this interview to a finality. If you had spoken out on these issues earlier, perhaps today we would not be in a situation where India is not the preferred investment destination. You get my point? RAHUL: Actually, the RTI right, has basically changed the game in India. What it has done, is that it has basically opened up the structures. And what used to be hidden, can no longer be hidden. That's the bottom line. The bottom line is large number of corruption issues that were hidden, that nobody would have found out about, came out because of the RTI. We did that. Now please go to our Opposition states, please go to their states and ask them if they have RTI Commissioners. The issue here is very simple. The issue is do you want an open system? Do you want a system where these things are out in the open? Or do you want a closed system where these things are hidden? ARNAB: The debate has to take place between individuals. My final question, Mr. Gandhi. Will you be open to a debate between key candidates or representatives of the major parties? Will you participate in such a debate if there were to be one? RAHUL: There is a national debate taking place right now. The national debate taking place right now is the following. There is the Congress Party that believes in openness, that believes in RTI, that believes in Panchayati Raj, that believes in giving people power. And there is our Opposition that believes in concentrated power. That's the debate that's taking place. That's what the election is all about. We fundamentally believe and the Congress Party has always believed that this country has to be ruled by its people. ARNAB: Can you take back this election or have you lost this election before its begun? Most of the surveys are saying Congress party will be reduced to its lowest ever tally. What would you say to that, Mr. Rahul Gandhi? RAHUL: This country has always been run and successfully when large numbers of people were involved in the decision making. Historically, when you look at when this country has done well, it has done well when we have involved people. ARNAB: You know what Modi says to that, he says you gave them 60 years. He says give me 60 months. He said that in U.P at Gorakhpur when he spoke recently. I want you to respond to that. RAHUL: My response to that is that in the last 10 years, we gave the country the fastest economic growth its ever had. My response is that, we did more for opening up the system than any Govt before us. My response is that we have completely changed the paradigm with our rights based development model. We have given MGNREGA which has transformed the rural economy. We are talking about AADHAR which is going to give money directly to the people. To just brush aside the idea that Congress party has been in power for 60 years, we are growing at the rate at which we are growing because of the Congress party. ARNAB: Are you battle ready? RAHUL: Battle ready, of course. We're going to win. ARNAB: Mr. Rahul Gandhi, thank you very much. It's been a pleasure talking to you. Vote! What do you think of Rahul's first TV interview?